Being overweight is just as much a problem for corporations as it is for you and me. And just as it is for us, it's usually the last ten pounds of corporate fat that are the most difficult to shed. 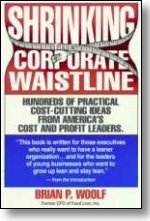 This book is written for those executives who really want to have a leaner organization, who are seeking additional insight into what corporate cost leaders are doing to maintain their very trim waistlines, as measured by their expense to sales ratio. It is also written for the leaders of young businesses who want to grow up lean and stay lean, who wish to avoid adding unnecessary weight as they hit business adolescence and adulthood. Most cost-saving ideas are common sense. Many are just "ounces" which, collectively, add up to pounds. Cost-saving opportunities are usually thinly layered throughout the whole corporate body with deeper layers in predictable places! There are no magic formulas or tricks when it comes to cost saving. Losing corporate, or personal, weight is not easy. It's a daily event. The book has two parts. Part A describes the advantages and characteristics of cost leaders together with an implementation plan for companies wishing to improve their relative cost position. Part B is an alphabetical checklist of cost-saving practices intended to help you review and improve the cost-consciousness of your company. The above tells us that for the latest 4-week accounting period, the Payroll Department used 1.86 employee hours to process each one hundred employee payroll records on average, a 6.1% improvement over the same period last year. However, on a year-to-date basis, the department's productivity of 1.93 hours for every 100 employees is 1.0% worse than for the same year-to-date period last year. Using a blanket purchase order avoids the cost of issuing a new purchase order for purchasing similar items over a period of time. For example, you may agree to purchase from a vendor 100,000 items, at X dollars per item, over the subsequent six months. Then, each time you order that item quote the one blanket purchase order number. This can be done for merchandise, equipment, supplies, etc. Another cost-conscious angle on this, when negotiating price, is to ask: "What price could you give us if we increased our order 10% (or 20%, or 40%, etc.)?" After receiving the new, lower price, respond by giving a blanket order for the larger quantity, together with a specific first order of, for example, 30 days supply, against the blanket order. For an organization to be truly cost-conscious, the CEO must constantly be challenging every part of the organization regarding costs. He challenges the buyers to ensure that they are receiving the very best buying terms. He challenges operations to simplify procedures to improve productivity. He challenges the insurance department to find better rates. He challenges accounting to locate better rental car discount rates than at present, etc., etc. After all, an axle that squeaks is eventually oiled! If the CEO squeaks about costs constantly, the organization becomes very cost conscious. On a regular basis, hire an invoice-checking firm to check your purchase records for the past 3-6 months. The outside firm will collect 50% of the difference between what you paid and any deals that were offered to the trade but for some reason you didn't take. You get the other 50%. It is also an excellent, cost-effective way to have a free audit of your buying and payables department. This is the greatest cost saver of all. Rather than cutting costs 10% across the board, it's preferable to identify those functions and departments that are no longer critical to the long-term success of the organization and eliminate them. Across the board cuts are unfair to those departments that are cost conscious. After a while, they'll give up and say, "There's no reason to be cost conscious if we are penalized equally with other departments." Once a year, conduct a company-wide forms review. New forms are always being introduced. Old forms are seldom eliminated. This review should challenge the use of each form, the simplicity of it, the number of carbonized sheets involved, and its distribution. Review also whether several forms can be merged into one form. Recently, I was horrified to see one company's internal stationery supply request forms in quadruplicate! Even headquarters people had to complete such forms to receive supplies from another part of the building! A single one-page request form would have been perfectly adequate! Charge a fee for each check garnished. Yes, this is legal. (See the fine print!) The charges are against the person paying the amount. The income received will help offset some of the administration costs of this procedure. Rather than having one week's sick pay available to employees each year, reverse the concept and make it one week's "health pay." This means that when an employee has a minor sickness during the year, he does not receive any payment for time off. However, during the first pay period of December, each employee receives 1.92% of his year's income for health pay. This encourages employees not to take time off to use up accumulated sick days. Further, it rewards your healthy employees. Its also acts as an incentive for employees to stay with the company through the end of each year, as anyone who leaves during the year loses their health pay for that year. On a regular basis, have groups of employees come together on a voluntary basis, to suggest ways to reduce costs and improve ways of dong things within the company. Every business is a process flow. The process can always be refined and improved. Cost-Conscious companies often include a cost clause in their job description. Somewhere in the job description they will insert the following phrase: "To find more efficient ways to do the job and to seek to reduce costs and improve labor productivity." Is a phrase similar to that in every job description in your company? This is the Japanese word meaning continuous improvement. This attitude is typical in cost-conscious companies and is reflected in such practices as quality improvement, suggestions, procedure manual reviews, etc. It's a mindset that underscores that no matter how well you are doing, you can always do better. It also reflects the mindset that, in a world of constant change, parts of your business are constantly becoming outmoded and are in need of change simply to stand still, let alone progress. Labor hours should be scheduled based upon standards for the core functions that must be performed every day and week, with an additional variable allowance for physically handling and selling the merchandise. Labor standards should be based upon the physical needs of the business and not in terms of a target wage percentage. They are expressed in physical terms related to physical items (e.g., items per hour) for year-to-year productivity comparability. Once fair labor scheduling standards have been introduced, simply monitor and manage major exceptions each week. A simple way to avoid wasting of executive time looking for management reports is to develop a standardized management folder for each executive. Have separate tabs for week, month, quarter, year, and multi-year. At the start of each section, identify the reports that will be in that section, together with who prepares that report and the page number of the report. Also, the page numbering system should be identified on the management report, for standardized easy filing. For example, your monthly tab might include the following. Your secretary can update your statistics book as soon as each new management report is received. As expenses usually vary in direct proportion to volume, comparing each store against its peers' actual results and not against a budget provides a real comparison and incentive to improve. Every manager wants to perform better than his peers. Further, as managers improve their individual performances against the average, that, in turn, improves the overall average for their sales volume class. This norm form reporting system provides the company with a method of constantly improving results and provides a target which floats with the real conditions that particular week, month, or quarter, as opposed to some static budget figure determined at the start of the year. It is a far more effective self-management tool than a fixed annual budget. A simple example of a Norm Form is included in the appendix. Too much time is spent on the Income Statement and too little on the Balance Sheet. This is because the typical balance sheet is not user-friendly. Make it so by dividing each total by the number of stores both for this year and last year. Then identify, by line item, where investment costs are increasing and decreasing for the average store. This is a very simple and effective measuring tool that will help you reduce your net investment per store thereby freeing cash for other purposes. A typical operating balance sheet for a chain retail or service company is included in the appendix. Two terms in purchase agreements that have saved companies lots of money are "most favored customer" and "won't exceed." Include in your purchase agreement a clause stating that you won't be charged more than the vendor's most favored customer. If your vendor won't agree to this, then get a commitment that your price won't exceed $X during the next 4 months. Simply attach a shareholder's mailing address label to his or her actual quarterly report and mail using bulk mail rates. Save the cost of the envelope and first class postage! Wherever possible, recognize people in some tangible way for cost-saving ideas. For example, in addition to anything else you do, you could give a coffee mug to every employee who comes up with a cost-reducing idea. The mug could have something appropriately inscribed on it such as "I saved the company money," or "I'm helping make the company great!" Not only does this recognize the contribution but it also reinforces the cost-conscious culture to all who see the mug. To simplify salary administration costs, all salary changes below a certain level should be made effective on the first pay period of each calendar quarter. Employees above that level could have their salary reviews made effective in the first pay period of either January or April (or some other month) each year. This will allow for a fairer review of relative performance done at the same time. Obviously, exceptions, where really necessary and with the appropriate approval, can be made to the above guidelines. Allocate tasks and functions to the area most skilled to do it. For example, the human resource department is more skilled in giving advice, etc., than in processing paperwork. Therefore, keep human resources to a small core of competent specialists working in their field. Pass on the processing of payroll, insurance, even the handling of a great deal of their paperwork to the process-oriented accounting department. Light switches for closets and interior areas can be colored and equipped with a light when the light in these enclosed areas is on. Similarly, you can use color-coded light switches to designate which should be on and off during non-operating or non-office hours. Alternately, you can put 5-minute shut-off timers on such lights. In back rooms and storage areas, remove some of the florescent tubes to reduce the lighting intensity to a level appropriate for such areas. Have a policy of "use them or lose them." One cost-conscious approach is to have vacations fall due for all employees on the same date each year. Then allow employees 12 months from that date to use the vacation time earned in the previous period. In setting the date, it's best to choose a date that is preceded by a quiet period, as some employees will, each year, delay taking their vacations until the last moment. Ask yourself: what if a real, no-nonsense cost cutter came in to run this business? What would he eliminate? How much would someone like "Ming the Merciless" really cut and eliminate from the way your business is currently run? What would happen if you did those same things? Wherever possible, presort your mail by zip and get a reduced rate from the Post Office. For those companies that don't have a large quantity of mail, mail-sorting companies will include your mail with their total and share the presorting price break with you.